PicMonkey is a free online tool for editing photos and creating graphics. It’s easy and intuitive to use, and it’s more powerful than many people realize. I’m a PicMonkey superfan! 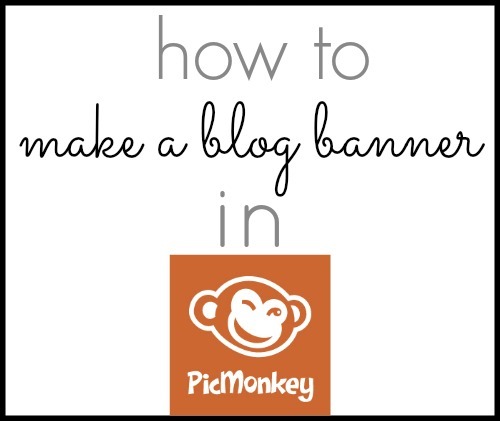 Today I’m going to show you how to easily create a beautiful new banner for your blog or Etsy shop, for free, using PicMonkey. 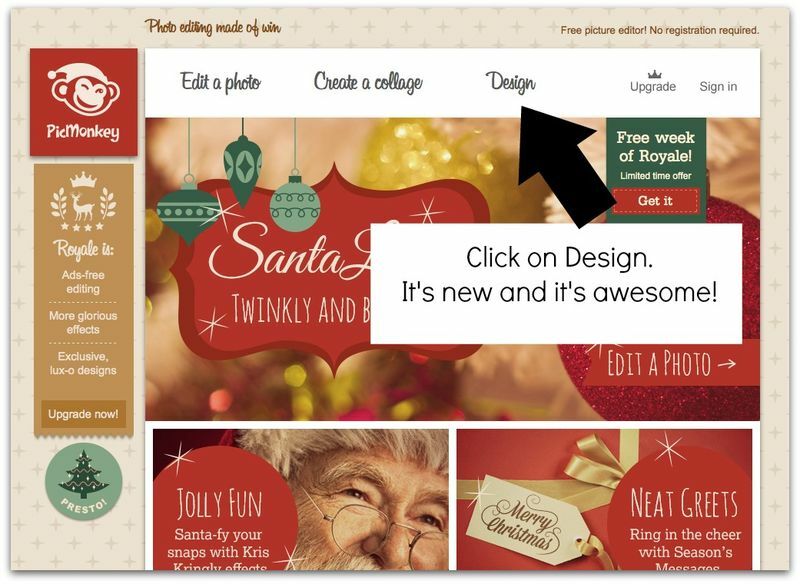 Head over to PicMonkey and you’ll see a brand new feature right on the homepage: design. The new design option is terrific because it allows you to immediately jump into designing something on a blank canvas. PicMonkey give you several sizes to choose from, or you can create a custom size. For this project I chose “custom” and plugged in the banner size needed for my Typepad blog. 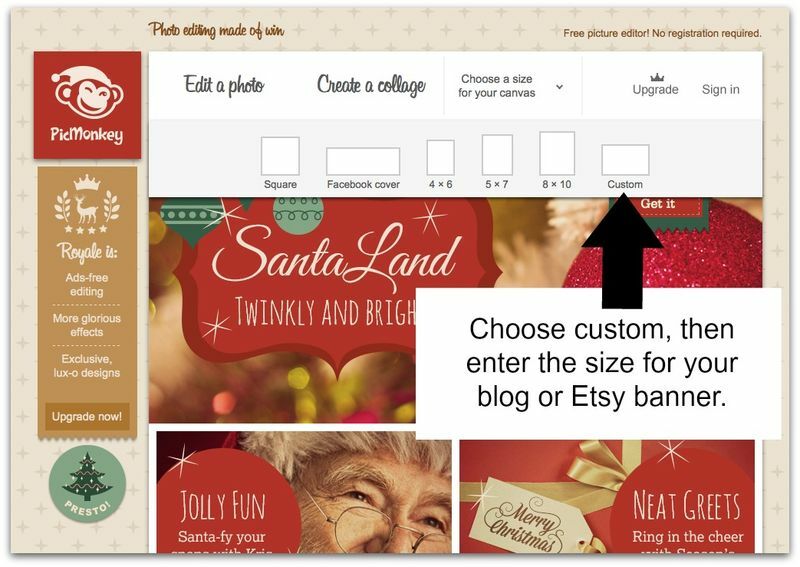 You could plug in the size for an Etsy banner (760 x 100) or the size required by your blogging platform (you can also select “Facebook cover” and easily create a perfectly sized cover image for your Facebook page). Now you’ll enter the editor and get started designing your project. 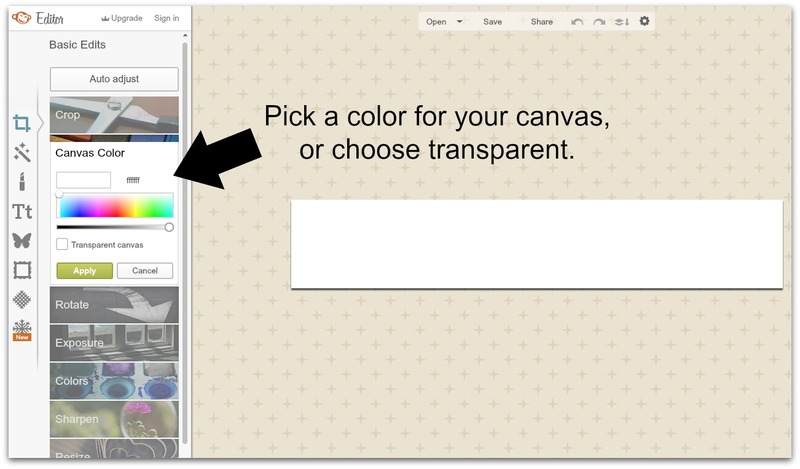 You can choose a background color or make your background transparent. I chose to make mine white so that it will blend with the white background on my blog (Etsy also has a white background). If you don’t find something you like, you can bring in your own graphics. I suggest bringing in graphics that are .PNG files. These are easy to layer over one another with no square background getting in your way. 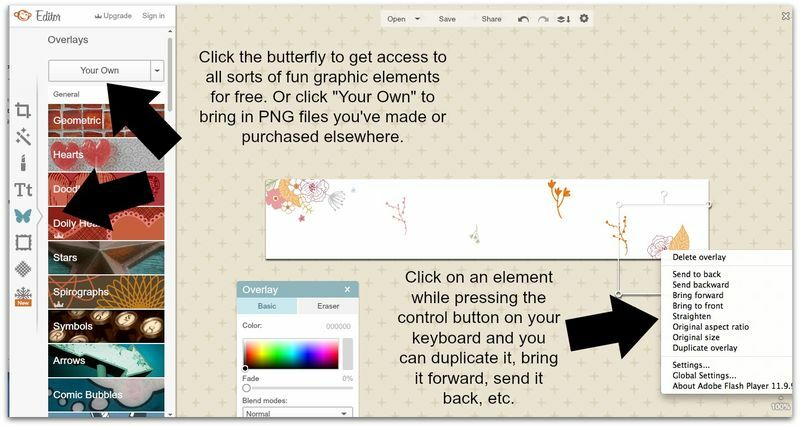 So where can you find nice .PNGs if you don’t know how to make them yourself? You can buy sets of them for just a few dollars. Search on Etsy for “clipart” or head over to Creative Market and look under the “graphics” tab. Take minute on both sites to check the license for the graphics you’re considering purchasing to be sure you’re allowed to use them for your intended project. I bought a really pretty set of flowers on Creative Market. For $7 I got 16 .PNGs instantly. I’ll use these throughout my blog in buttons and on various pages to make a really nice, unified theme (yay, more PicMonkey projects!). I uploaded them to PicMonkey and started to play. To make them larger and smaller, or rotate them, just grab the corner of the object and drag. By clicking on one while holding down the Control button on my keyboard I get a menu that allows me to send them forward or back and duplicate them. Now add some text. Change the font, colors, and sizes of the words until you arrive at something pretty. Once you have something you like, you can merge the layers. That way when you add more things the first layers won’t move around and annoy you. Yay! Your banner looks awesome! Now save it and upload it to your blog or Etsy shop. I had so much fun making it! Now my blog looks fresh and new for the start of 2014. Thanks Abby for the tutorial and link to Creative Market. So glad to hear it, Sharon. It’s actually really fun to work on! Creative Market is really cool. So many great graphics to buy, at reasonable cost, to make your site look customized. I’m kinda in love! Genius! I love it. I play around in PicMonkey a ton but didn’t know how to use the Design section. Heck. I didn’t even notice it! You are such a PicMonkey guru! I’m a big PicMonkey fan too, a few months ago I decided to show them just how much I appreciated all their hard work & took out a subscription, so now I get to play with everything on the site … YAY! Your new banner looks great, very pretty. I have been considering re-doing mine too for the new year so this tutorial will be a great help. PicMonkey is so easy and while it’s not as powerful as Photoshop Elements, you can do so much with it! Good luck with your shop, Heather. Right! It’s so doable with PicMonkey. I’m glad you found this tutorial to be helpful, Toni. I followed your tutorial to make an Etsy banner. Thanks so much! Thank you for this!!! 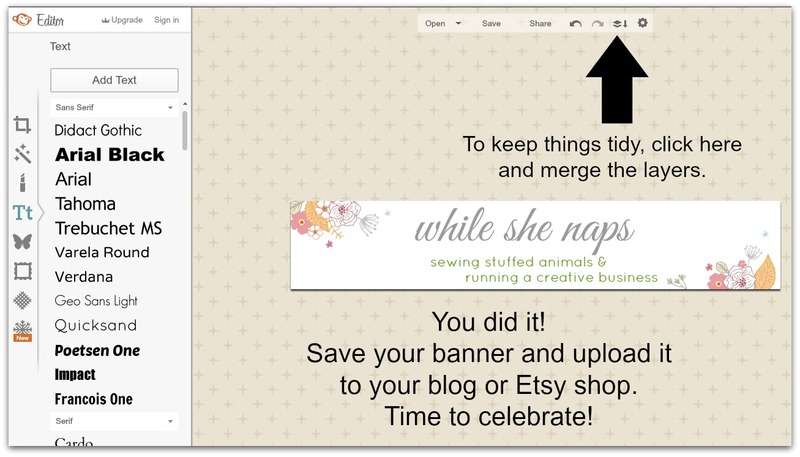 I just created an Etsy banner with your step-by-step instructions!! Your post made it so simple, thanks!! Great tutorial on a wonderful tool, thanks! Fantastic piece ! For my two cents , if you is interested in merging of PDF or PNG files , my business encountered a service here http://bit.ly/1QsTA8W. Great post! I’m using it today! Thanks for the article – I’ve been looking for different options to develop some professional looking banners for my website and I’m beginning to think that PicMonkey is a very viable option. Thank you again – keep up the great work!